I think I am #0043 .... so hopefully I'll see the Solaris by my 50th birthday, which is Jan. 12, 2012. Solaris #25 arrived to me yesterday. Solaris #28 arrived tonight. Dark. To echo what I've heard in this forum over and over, the wait was worth it. The sound quality is beyond reproach. So far I'm just paging through presets and then fiddling with those. Tomorrow, I'll try starting from scratch. Solaris #29 (white) arrived yesterday also! A friend who came over for a visit, had never heard of Solaris and was blown away by the sound of it! He immediately recognized how vintage and futuristic it sounds all at once. Needless to say, I was up until five this morning and up at nine ready for more! #19 is here .. just going through the presets and I'm really impressed with not just the clarity and sound quality, but also the aggressive grittiness most digital synths (in my limited experience) lack. I had the privilege of having a prototype in my studio on two separate occasions and made a few demos that were shared here on the forum, but I did not hear then what I'm hearing in the production model now. The presets (I've only been up to 52 so far) are really deep and complex. They really showcase the 'Solaris' sound which of course is John Bowen's sound. And they are very useful presets! This is the newest piece of gear I have by decades (not including the Moog Voyager which is actually my wife's but she lets me play it sometimes) and I almost feel that John's sound was limited by the architecture of the Prophet-5 and what I'm hearing in the Solaris is definitely beyond that. The old Analog vs. Digital argument isn't going to work here, unless you just want to quibble. Does that make any sense? The Prophet-5's presets are so widely known by synth folks, that I think if you've ever owned one you'd sink right into the Solaris sound. The controls are quality .. I love the wheel, the solid feeling encoders, the joystick (good choice on that! ), the high end fatar keyboard and the ribbon controller (I still prefer the weave type, but I can appreciate this one, especially since it spans the freakin' keyboard!). It shows that a lot of thought and uncompromising effort went into the choice and design. I did notice some noise when adjusting the arpeggiator clock while playing a sound, but all other encoders seem to not introduce any artifacts. And yeah, check out patch 52 .. that is the right way to do it and the DSI Prophet '08's attempt is sickly awful in comparison. I'll be staying up late and hopefully making some tunes. I'm already feeling inspired by the new arsenal of sounds. What is that above your Solaris? 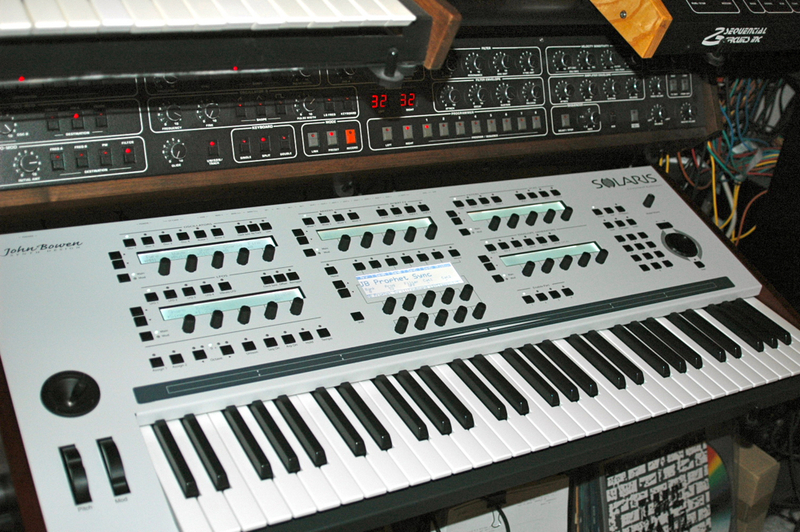 A custom Prophet 5 sans keyboard? I believe that's his 'chopped' T8. Chopped T8? You removed the best part (PolyAT keyboard)! It never had a keyboard. John knows, Stanley Steamed.